Washington, February 5th – With states across the country facing dire fiscal crunches and lawmakers in Washington gearing up for more budget showdowns, U.S. PIRG Education Fund released a new study revealing that state budgets were hit collectively with $40 billion in lost revenue from offshore tax dodging last year. Many of America’s wealthiest individuals and largest corporations use tax loopholes to shift profits made in America to offshore tax havens, where they pay little to no taxes. U.S. PIRG Education Fund was joined at the event by Congressman Lloyd Doggett, the Main Street Alliance, the American Sustainable Business Council, and a small business owner. "Our economic progress is undermined when companies are rewarded for financial manipulation rather than innovation and productive investment," said Bryan McGannon, Deputy Director of Policy at the American Sustainable Business Council. Tax havens are used by both wealthy individuals and corporations. 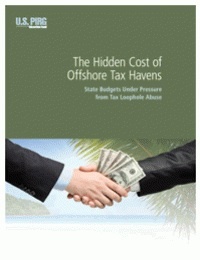 The study found that states lost $28 billion from the corporate abuse of tax havens and $12 billion from individuals. As of 2008, at least 83 of the top 100 publicly traded corporations in the U.S. used tax havens, according to the Government Accountability Office. At the end of 2011, 290 of the top Fortune 500 companies reported that they collectively held a staggering $1.6 trillion offshore, a Citizens for Tax Justice report found. By using offshore tax havens, corporations and wealthy individuals shift the tax burden to ordinary Americans, forcing us to make up the difference through cutting public services, growing our already big deficit, or raising taxes on everyday citizens. “Some budget decisions are tough, but closing the offshore tax loopholes that let large companies shift their tax burden to the rest of us is a no-brainer,” Smith added. • Google used accounting techniques nicknamed the “double Irish” and the “Dutch sandwich,” which involved two Irish subsidiaries and one in Bermuda, to help shrink its tax bill by $3.1 billion from 2008 to 2010. • Wells Fargo paid no federal income taxes in 2008, 2009, and 2010, despite being profitable all three years, largely due to its use of 58 offshore tax haven subsidiaries. • Microsoft avoided $4.5 billion in federal income taxes over three years by using sophisticated accounting tricks to artificially shift its income to tax-friendly Puerto Rico. The company pays its Puerto Rican subsidiary 47% of the revenue generated from its American sales, despite the fact that those products were developed and sold in the U.S.